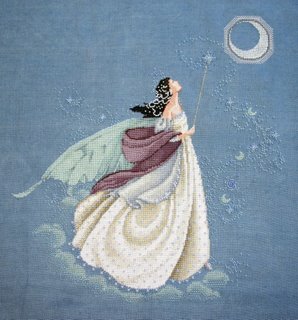 After my stitching dilemma I chose to do Fairy Moon by Mirabilia. It took seven weeks to stitch. I have started a new way of stitching. Instead of stitching in the lounge room watching/ listening to a movie. I have been sitting in the study where David has been working and listening to audio books. Whilst stitching Fairy Moon I have listened to Jane Austen's Pride and Prejudice, Emma and Sense and Sensibility, PG Wodehouse's Love among the Chickens and Jeeves in the Offing, also half of Jules Verne's Journey to the Centre of the Earth. 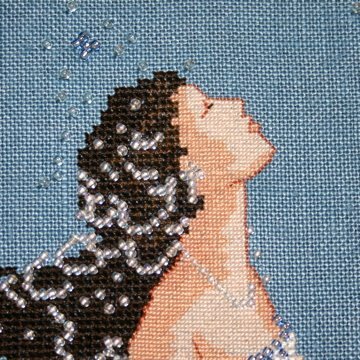 This design has more beads sewn on than any I have previously stitched. It has been quite interesting to stitch. The face I have stitched over one again. This time she seemed to have a lot of flesh and it was a challenge to keep going with the skin. The face was only completed near the very end of the whole project, even though I always start at the top and work down. If you click the full photo you will get a larger version. David has taken a close up of the face so you can see the detail "one over one" stitching provides. The beads in the hair are meant to be "strands of lustrous pearls woven throughout her chestnut hair" according to the designer's website. David reckons it looks like she didn't clean out her hair after washing. He gets great enjoyment reading the flowery descriptions of the cross stitch designers. Naturally enough, I have now started another Cross Stitch, Stargazer by Mirabilia. "As the lady watches the sky filled with luminous diamonds she wishes upon them all." Can you hear David chuckling as he reads this? "All bunch together so I can see!" I am away from home, helping one of my clients and staying at a motel overnight for most of this week. Although this saves many hours of driving, money in fuel and is a lot safer, it means I am away from the family. This is where technology comes in. The hotel has broadband/DSL internet access, I have web cameras both with me and another attached to the PC in my office, and we have accounts for myself and Lana in Skype and MSN Messenger. Skype is great for voice communication, but the video can be patchy. MSN Messenger is great with the video but voice is of variable quality. So I call Lana via Skype and then we turn on the webcam via MSN. So from hundreds of kilometres away I am able to say goodnight to the children, we can say our nightly prayers together, and the children are able to show me what they did today. James showed me a pretty tricky Lego creation, complete with hatches, secret bits, spots for men to hide in and so on. All via a webcam. Now that's a pretty handy use of technology. 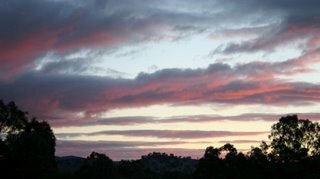 The latest Carnival of Family Life is now up with a interesting collection of posts celebrating family life. I especially enjoyed the cartoon about Warning Labels at Creative Homeschooling. 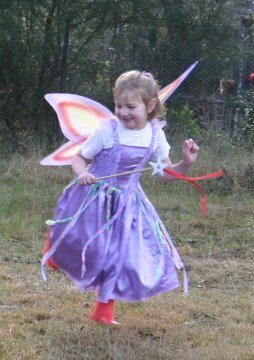 Our post on International Fairy Day is included. If you do a Google search on "International Fairy Day" we come up as the second choice! It's already the 16th Carnival of Children's Comedy, this time hosted by Principled Discovery whilst Kim of Life in a shoe is almost there (at Walmart!) with her latest baby. Our not so little mouse and Fairy Day woes are included. I liked this carnival's presentation with all the interesting posts woven into the narrative. Well done Dana! 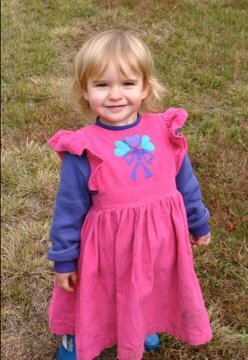 One benefit of being the youngest cousins on one side is that the hand me downs are pretty good. Lana's sister was very generous to pass onto us a really good bike for Ariel which had hardly been used. It only required a little maintenance. In fact, all the children's bikes were in need of tightening, oiling and checking over, so today was the day. One of the tires in Ariel's bike had a hole. Actually after fixing that we found a second hole. And then after fixing that hole, the first repair came loose and the air escaped again! On the fourth removal of the wheel we installed a new tire and left the old one as a spare. Meanwhile I oiled each of the chains and wheels and moving bits, showing the children how to do this for themselves in future. Ariel became very adept at removing wheels. Finally all the bikes were up and running and the children were able to ride their own bikes around the yard. Run quick. Fairies run to make flowers bloom!We awoke this morning to the sun peering through clouded windows. "Oh no!" we thought, "We're too late!" Sure enough, when we ventured outside the fairies had obviously flattened out the frost with their multi coloured gum (rubber) boots. But this didn't stop our bigger fairies taking advantage of International Fairies Day. All three dressed in their costumes and prepared for a dance in the cool morning air around the only flowering plant in the garden - our Wattle tree. What a silly day for fairies to celebrate - right in the middle of Winter! Look! You can fly!The smaller costumes we obtained whilst living in the US on the best day to buy costumes - the day after Halloween! All costumes were half price at WalMart. Ariel's costume was one Lana and her made last year. Either it has shrunk or Ariel has grown a lot! Ariel helped the little girls get dressed and made two special wands. The girls put on their gumboots to complete the ensemble and danced outside. It was a bit chilly so after about 15 minutes they quickly scampered inside for a hot breakfast of bacon and eggs. As we were inside getting warm, Ariel commented, "How can people be sad when there's babies and little dogs to brighten up the day?" Last night the girls were gathering all the costumes ready for this morning. 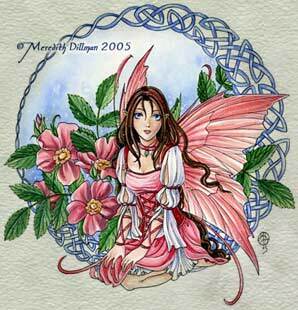 Not one to miss her chance, Clare innocently suggested, "Girls should get presents because it's Fairy Day." Will waving my wand get presents?Ariel agreed and asked us, "Since it's Fairy Day we should get presents." I asked Clare what she thought was the best thing about Fairy Day. "My dress, and wings and wand and we get to play." Aaargh. This is going to take some work to stomp out this superstition. "Go on Dad." Ariel is prompting me whilst I am typing, "We should get presents." Stupid Fairy Day. Whose idea was this anyway? In response to a number of queries as to what Bread maker we use, here is our experience. We have tried a number of bread makers since they first began to be popular. The best we have used is the Panasonic SD-YD250. In Australia we first had a smaller Panasonic, but the loaves were not big enough to handle our family's growing appetites. 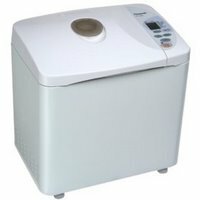 Then we purchased a larger bread maker from another brand and it was terrible. The loaf was bigger, but our success ratio plummetted. The only times our Panasonic failed was when we fogot the yeast or mucked up the water content. In our first week of arriving in the US we tried the local bread. It remained soft (aka "Fresh") for the next two weeks! We quickly bought the Panasonic from Amazon, our friendly UPS man delivered it and we never bought store bread again. As an accountant I naturally did a price comparison. Including power consumption, the home made bread cost around 40% of the store bought bread price. Make sure you buy dry yeast in the compressed bulk packets. These only cost about $2.50 (US) for 2 x 500g/1lb at Sam's Club. Don't waste money on sachets! 1. Weight the flour. This makes a more consistent loaf. 2. A premix flour (bought in bulk) makes loafmaking really easy. Just add water and yeast and the children can do it. 3. When the weather is cold, used luke warm water. Otherwise the yeast doesn't react properly. 4. Cut the bread in the middle from top to bottom, and then place the open side down, cutting slices. This is the easiest way to provide reasonable sized slices. 5. An electric knife works great. 6. 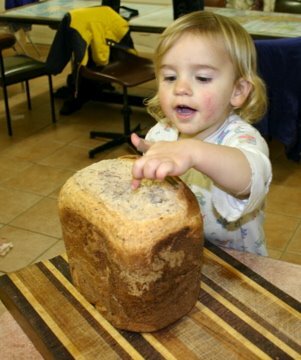 Keep fresh bread away from 2 year olds until the bread is ready to eat! We bake our daily bread in a lovely bread machine. One of the children places all the ingredients in the machine, presses the button and in a couple of hours we have lovely fresh bread. Yesterday, however, we had a problem. There was a huge chunk taken out of the bread, about the shape and size of a small hand. This was not the job of a normal mouse. We were pretty sure it was Rose. Today there was a lovely chunk out of the top of the raisin loaf we made. Here is Rose pointing out where she started to share the fresh loaf. "Did you take out the top of the bread?" we asked. "Yes. You have to wait until we cut the bread." Michael of Family School has posted a delightful story of his children growing up. While we were walking into town for ice cream the other day, Nathaniel asked his mother to hold his hand. Camille did. He said, “No, like Daddy holds it,” and carefully put her arm through his. International Fairy Day - beware! 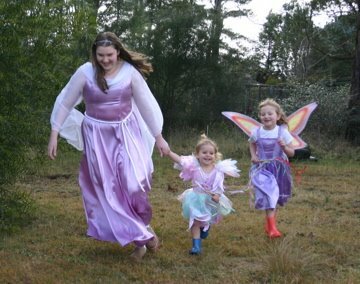 This Saturday is International Fairy Day. This must be because it is an early day in Summer for those living in the Northern hemisphere. 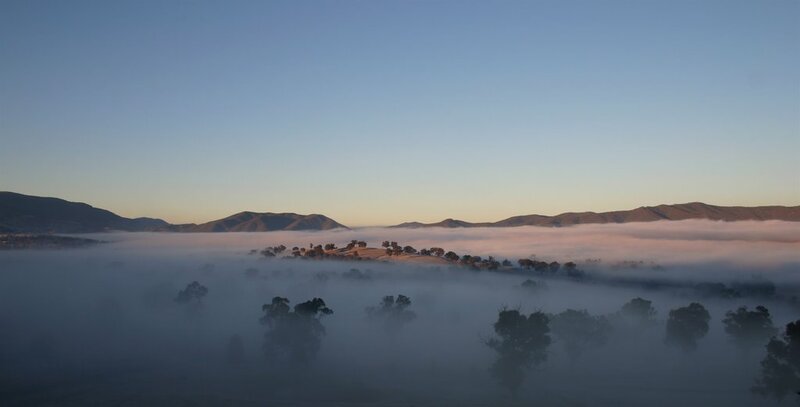 I suspect that all the fairies in Australia will emerge exhaling little puffs of foggy breath, wearing overcoats, woollen hats and scarves and dancing with little padded gumboots making itsy bitsy imprints in the delicate frost and ice. The above web site has lots of activities and ideas for the day. Ariel has had a lot of fun exploring the site and Clare is looking forward to being a fairy on Saturday. Any excuse would be fine, but an actual Fairy day is the perfect reason! 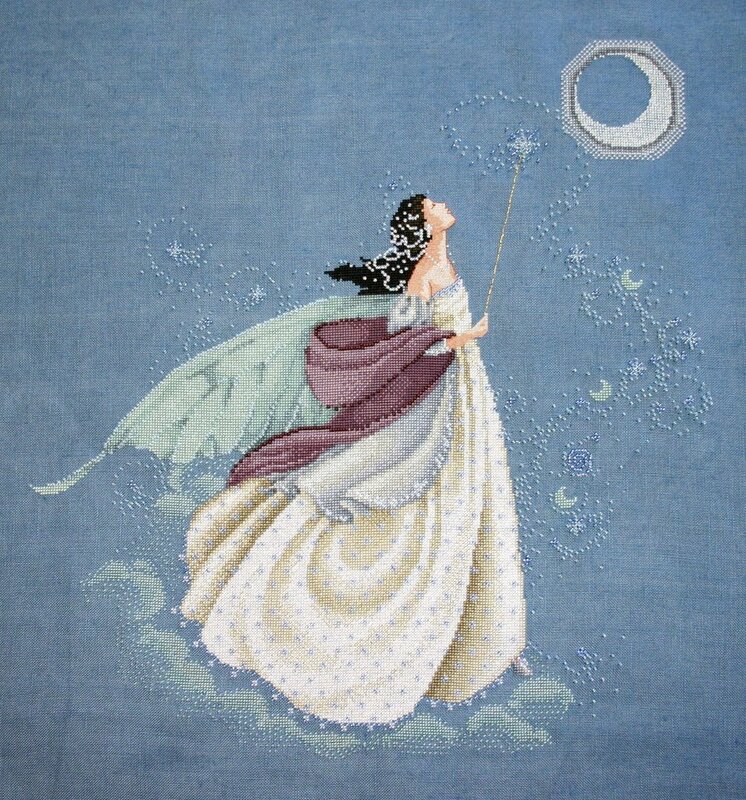 To honour the occasion, Lana has found a free fairy cross stitch pattern from Passione Ricamo. The picture is stitched in one colour, with simple crosses and some backstitch. This would make a perfect project for the newer cross stitch fanatics. 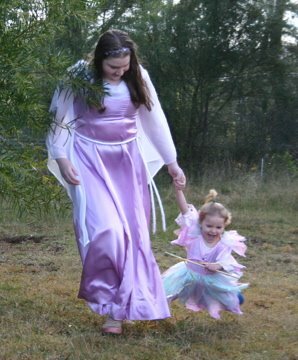 Update: The girls did their Fairy bit on Saturday. Michael Grosch and Edward Nemeth are seminarians from St Louis. 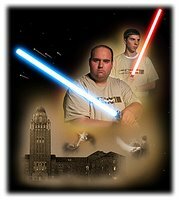 In this marvellous video the two use The Force and light sabers to determine who will be the activity director at a summer camp they are organising. Warning - the file is over 12mb. Make sure you also check out The Story and Frequently Asked Questions (which includes details of how they made very "realistic" light sabers from toilet parts.). They also run a blog Matthew 12:37 which is interesting, especially this post about a very odd squirrel. To complete the Father's Day trio the huge 6th Carnival of Family Life is now up. Our entry "A Winter's Day" is included. It may be quite cool here in the Highlands, but it was certainly colder when we were in the US at an equivalent point during Winter. I'll just slide along here. Today was a special day at Church. It was the Feast of Corpus Christi (Latin for Body of Christ - see John 6), one of the homeschooling children had their first Holy Communion, it was the regular homeschooling gathering and we had a procession. Winter has really set in and any areas remaining in shadow retain their frost a long time into the day. Our children really enjoyed sliding on the frost remaining outside the church at 11:00am. After Mass we joined in the Eucharistic procession. 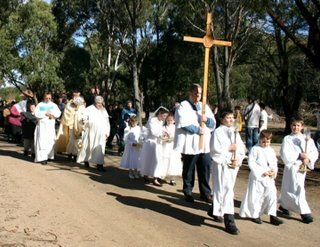 The tradition of Corpus Christi processions began some time in the 12th Century, and are held today throughout the world. Then the rest of the people follow saying prayers and singing hymns. It was a great day. It was a time to celebrate the gift Jesus gave us, enjoy the company of other families and attempt to stay warm in the occasional patches of sunlight. The Children's comedy carnival is up today with a Father's Day themed post. Our selection of children's quotes from last week is included. Lana did enjoy the Blogads on Life in a Shoe for Natural Parenting. One of T-Shirts has the message "I make Milk. What's your superpower?" Does my foot measure up? We are on first name terms with our local shoe shop man. He smiles when we enter and waves at us as we pass his door. When I first visited him to buy shoes I smiled and asked him "Can you give us a bulk deal? I need shoes for everyone." He looked at the many feet and said, "I'm sure we can do something." Eight people in the family mean sixteen feet for which to find shoes. Boys' activities seem to eat shoes pretty quickly, and combined with all the children's rapid growth, this results in many trips to the shoe shop. We get great service with each child checked for the correct fitting shoes and he always gives us a fair price. This photo is from Rose's first time getting shoes since returning to Australia, when she was able to sit on the special children's bench. She was a very good girl sticking out her feet for measuring and fitting, and then enthusiastically jumping up and down and running when we asked her to test the shoes. The local paper had a great story on page 2, following up from the presentation on Tuesday. Ariel is now going through her iTunes lists to see how many books and music she can cram into 1gb! This morning was very chilly (around -5C/23F) at my client's home where I was staying overnight away from home. The view from my window was like a land whale arising out of a sea of fog, stalked by shadowy enemies, moving towards the distant land. Either that or the top of an intervening hill. Click the photo for better detail. Then in the evening as I was ready to start my 2.5 to 3 hour drive home I was given a farewell of this lovely sunset, with the clouds lined by a burning red brilliance. This is why I always carry my camera in the car. I never know when I am going to see something and want to share the experience. Dawn of "This Woman's Work" posts a very amusing Top 10 list of answers you should NOT give to the question when seen out and about, "What? No school today?" There isn’t? Why, you’d think we’d see more kids out then, don’t you? 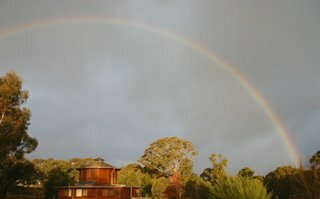 The 24th Carnival of Homeschooling is being hosted by About Homeschooling and centres on Fathers being celebrated in the US this past weekend. In Australia Father's Day is in September which made it very odd when we lived in the US. I would call Dad in June for Father's Day and he would give me a bemused "Thanks." But when I forgot in September until a few days afterwards I had to quickly call and explain the timing problem! Our post about Lana's initial Homeschooling worries is included. Update: Check out this fascinating tale of the life of a pet caterpillar and the mysterious intruder into Caterpillar heaven at The Lilting House. Sometimes it becomes pretty tiring going to each of your favourite blogs in your bookmarks/favorites list just to see if they have posted something new. An elegant solution to this is to create a Bloglines account. Bloglines provides a service whereby you add the RSS (Really Simple Syndication) feed to your account which will track the blog postings for anything new. Then just go to Bloglines. I have added an icon on the left column to easily add Bruggie Tales to your bloglines account. 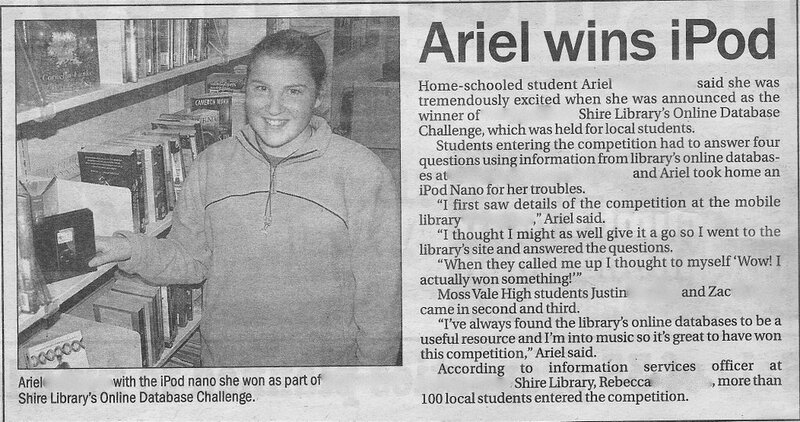 Here is Ariel receiving First prize in the "Online Database Challenge" conducted by our local Library. She is now playing with her shiny black 1gb iPod Nano. 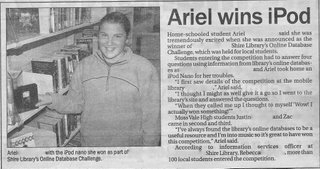 We attended the presentation at the main library with a reporter from the local paper taking pictures and interviewing Ariel. There were over 100 entries and Ariel's was the first correct entry chosen. I kept asking her if she had her acceptance speech ready but they luckily didn't expect any. This is solid ice! Brrrr.We have had a spell of chilly weather over the last few days. To satisfy our information needs and my Bruggie Tales reporting duty, I sent Lana out into the cold last night to check the temperature. (Lana had some slippers on so she qualified as the most approprately dressed.) -3C! (26F) No wonder we were cold. 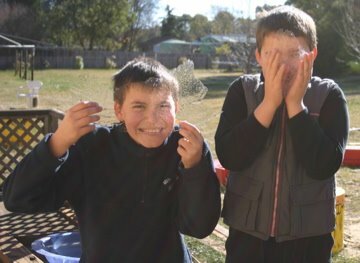 This morning Eric and James went outside and found some ice still on a small pool of water at about 10:00am. Naturally we decided to go for a walk in the early afternoon. "What's in my sandal? Oooow! "Despite cold noses we enjoyed the walk on the nearby trails and forest. Clare learnt the hard way that sandals are not the best winter foot wear, especially on trails frequented by horses. Horses tend to leave calling cards and sandals are open at the front. For a child who likes kicking dirt on the trail this spelled trouble. The bonus of going for a walk with Rose travelling in the pram is that by the time we returned home she was fast asleep. Success! Dog or Cat? You decide.The children are pretty observant during our walks. Clare keeps running up to us with a weed or a seed or stalk of grass and saying, "Can this go in the Treasure Table?" "I'm sorry Clare," we sadly reply, "But it will just turn brown or rot. Keep looking." James stopped at one point on the trail and pointed up. "That looks like a dog." The other children agreed (except Clare - "It's a cat!") and I captured the moment here for you to see for yourself. 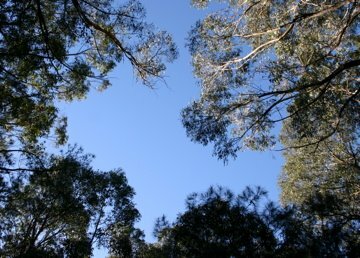 The sky shape bordered by the tree branches and leaves has a distinct shape. That is how we spent the Queen's Birthday holiday in country New South Wales. I am sure all those wanting a Republic worked hard today, not wanting to celebrate the Queen's Birthday, but we had fun. The 5th Carnival of Family Life is now up. There are lots of great stories from families living in all sorts of places around the world. Our post of Rose's second birthday is included. Art Attack! There is no defence. 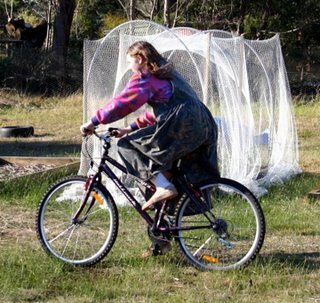 Ariel has found a great new site following a trail from Karen Edmiston and then Lapaz Farm Home Learning. Art Attack has a huge collection of art projects, guaranteed to make both an interesting craft project and a mess. Ariel is only part way through looking over the long list of projects but I have heard many joyful comments. Clare has been looking over her shoulder and helping by saying, "I want that one!" The Fairy Dust Pictures project (which is where the whole exploration began) is particularly tempting. Tonight we had the great pleasure of watching the BBC production of Shakespeare's play "All's Well That Ends Well". We thoroughly enjoyed the play. Our plan of starting with Shakespeare's comedies is paying off well. The unfamiliar language and styles of speech are no longer intimidating, we are used to detailed plots and now know that all the threads will be gathered together at the end. As the closing credits were displayed, we were all smiling broadly and James (10) informed me, "I liked that play Dad." This play covers Marriage, fidelity, virtue, honesty, vanity of wealth and titles, just rewards for good and bad all interwoven into a clever plot. Initially the earlier scenes appeared to have no role in the story. Then in the final scene every previous section came crashing to a brilliant ending. I'm not going to give away the plot as that may ruin the surprise. Make sure you watch the play with subtitles as this is the best way to catch all the important dialogue. Later we will watch the play again and gather even more of the clues strewn about in the earlier scenes. The play led to several discussions about what makes a valid marriage, the importance of "knowing" before one can truly love, how the person's virtue and honesty are worth a "far greater dowry than titles". Why Homeschool is hosting this week's Carnival of Children's Comedy. Ariel's attempts to defend her lolly stash is included. These carnivals are a great way of seeing the lighter side of children. Normally the culprits are the littler children but we have been paying attention to what all the children are doing. We have found that although the little ones may make the funny statements, it is their interaction with the other brothers and sisters which is the cause. A friend of ours asked us a question about her son (8) and we thought it would be great to ask for your ideas. So many of you have a wealth of experience, your help would be greatly appreciated. "My son is 8 and a leftie who detests coloring and writing, though he is an excellent reader. When asked why he hates them the answers were (coloring) "It's boring", and (writing) "It is messy." And as I think one helps the other I want him to improve his handwriting, which as he tries to hurry all the time, it is terrible to try to decipher. I was wondering if you have any ideas to help him practice his penmanship over the summer months (June 13 until Aug 29)." Boys almost always hate writing and colouring in boring stuff. The key is to provide a reason for doing the work. Whilst Ariel and Clare will happily colour in anything and even practice writing, the boys need to have a reason. James decided he wanted to put up signs on every door indicating the purpose of the room. He did a great job and practised hard until his writing was quite neat. Other than that he writes the minimum. Eric will write the minimum for his school work, but when it comes to creating a wargaming scenario or secret notes to his brothers - no worries! In what is he interested? Our boys like soldiers and knights so we downloaded some great pictures of knights and stuff which they happily colour in. Does he have any friends he would like to play "spies" and exchange coded messages? Nothing ruins a coded message quicker than illegible writing. We also get the children to do copy work. They have an interesting selection and copy it in hand writing into their book. We have used the bible, prayers or stories. But only in small doses - no longer than 15 minutes, perhaps a paragraph at a time. Writing with little hands can be quite a challenge. The key is to make it a game and linked to something he enjoys. This should do two things. Make the summer break fun and memorable, and perhaps - perhaps - improve his hand control so that writing isn't such a drag. Now - over to our experienced visitors. Any ideas? "You have to blow like this!". This weekend we had a small party for Rose's 2nd Birthday. My, how time has flown. Her history is the best recorded on Bruggie Tales and you can see her birth photos here and here and her first birthday party here. As this is her first birthday where she is far more conscious of all that is happening, we were fascinated in how she reacted to HER birthday. She wasn't sure about the privilege of sitting in DAD's chair, but she did like the lollies under the bowls at breakfast. Every time we sang "Happy Birthday" she joined in. 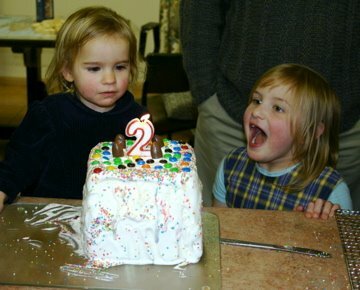 But when we asked her to blow out the candle on her birthday cake she wasn't sure what to do. Normally the other children blow out their own candles well before she gets a chance. This morning was very busy with everyone pitching in and cleaning the house. The two youngest girls, Clare and Rose, had to clean up the debri on their bedroom floor. Some time later Clare (wearing a white fairy dress) bounces into the kitchen where Lana and Ariel were baking yummy stuff and Lana noticed Rose eating. "An orange lolly." Clare replied. "From cleaning." Clare brightly responded. Lana turned to Ariel, "Did you have an orange lolly on your shelf?" *sigh* "Yes I did." Ariel replied, "Nothing's safe." Clare quickly skipped away to avoid any further controversy. Last night all the children were in bed supposedly asleep. I mentioned to Lana (in a conversational tone) that I was going outside to get my camera from the car when a voice comes from Ariel's room, "I already brought it in, Dad." "Thanks Ariel. Well done." I answered. "I'm a good girl I am!" Ariel replied in a cockney accent, just like Eliza Dolittle from Pygmalion (My Fair Lady). Lastly, I was having trouble yesterday posting the Maths Quiz results as the table put lots of blank spaces in the post. The preview was fine but the actual blog was wrong. 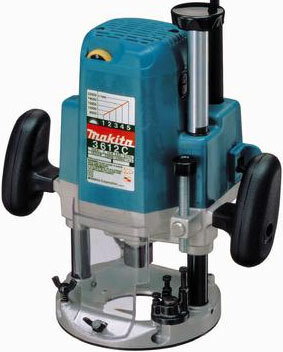 "This table is creating a huge post. I don't know what's wrong." I lamented. "They're not that big," I replied, not catching Ariel's point. "We always have big tables to fit all of us around." She explained. *groan* It's another of those jargon things. I think my children are catching my sense of humour. Obviously a huge danger of homeschooling. A Catholic Mom in Hawaii has set up a Catholic Homeschooling Blog Directory. There are two Australian sites listed now! 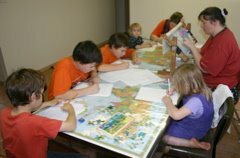 The Way of The Fathers blog has posted a great article on the methods used in the early years of the Church to encourage the youth. How did the Fathers do it? This is a good improvement over the months we have been doing the Maths Quiz. Accuracy has increased and speed has decreased. The time is in minutes. This means Ariel completed 50 division questions in 1 minute 40, or an average of 2 seconds per question. Now James is ready for 12 x 12 and we'll see how he goes on 100 + 100. I often help my friends with their computer setups. I try and avoid jargon where possible but sometimes the correct computer term is necessary. The problem arises when the same word means different things in different professions. My builder friend wanted help with networking his computers. I asked, "Do you have a router?" "Yes, certainly do." he confidently replied. "Then you only have to plug in the network cables ..." and I stopped at the quiet at the other end of the phone. Then I realised the confusion. "I mean a computer router. If you use yours you may get different results!" He did wonder why I asked if he had a router! We have a had a number of responses to our "Yes you can Homeschool" post and Lana wanted to add in some thoughts from when I first told her of my Great New Idea. 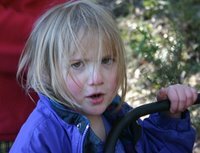 Her initial concern about whether she could homeschool was not fear of being inadequate. It was more a fear of taking on the responsibility. In today's society it is considered the school's job to teach children - with parents taking a secondary role. "What if I taught them the wrong stuff, or not enough?" "What if they didn't get enough variety? How can I do everything? Do you want hot meals and clean clothes or not?" As these were all initial reactions based on inadequate information, we had some investigating to do. Meeting other families, quizzing their children, checking for extra heads or weird looks in the children's eyes - are all the type of things you look for when you inquire into alternative lifestyles. Lana wasn't completely convinced, but other homeschoolers seemed pretty normal, even likeable, and their children appeared to be turning out well. So, we decided that we could give it a go. If it didn't work we could always put them into the school. But the funny thing was that as we began to homeschool and approach it as part of a complete life choice, all the other benefits starting accumulating and school just didn't make any more sense as an option. It wouldn't save time, the children would have more work and possibly less education, they would have less time with their siblings and we would see them less. Our life style is now built around the flexibility of homeschooling so seamlessly that to adopt a school-centred life would be quite traumatic. So ten years later, we are still going. I sent a thank you note to Palmtree Pundit with the closing line "Aloha" (she lives in Hawaii). In her reply she said "Mahalo". Now I had figured "Aloha" meant hello or goodbye, and this new word was obviously Hawaiian and needed to be investigated. Here is the answer - Aloha & Mahalo. Aloha and Mahalo are ineffable, indescribable, and undefinable with words alone; to be understood, they must be experienced. Does that help? Check out the link for more details and examples. Rose leading a decoy cow to the playground. The California Milk Processor Board is worried about cows that are being abducted by aliens. They have created a web site with all the information at www.cowabduction.com. 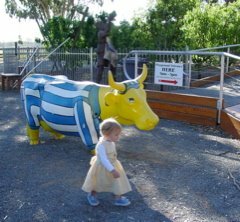 Considering the "evidence" that is presented on the site and the short documentary feature video we have had a revelation as to the painted cow statues we saw in Shepparton Victoria last year. Obviously the local dairy industry knew of the alien cow abductions and wanted to avoid scaring the populace. So they created a competition called Mooving Art for people to place cow statues around the town and surrounding areas. Knowing that aliens are colour blind they were able to disguise their abduction defence by having local artists decorate the cows and claim it was all a business promotion idea. Thanks to the power of the Interent, the Truth is Uncovered. Dan Brown - will you write a new book to reveal the truth in this matter? What if the grilling homeschooling families received was reversed? Red Sea School ponders the question in a brilliant satire. This is one of the links from the 23rd Homeschooling Carnival. 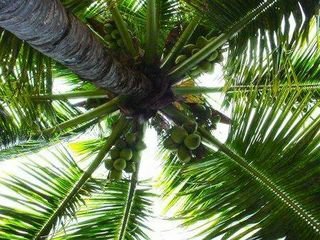 Palm Tree Pundit from Hawaii brings us the 23rd Carnival of Homeschooling chock full of homeschool related articles. Our encouragement for families considering homeschooling, "Yes You can Homeschool" is included. Today I was working from my home office for a change. I looked outside and observed the dark sky but stopped when I noticed a patch of coloured light. It was a very bright rainbow. Quickly I rushed outside with the children and captured the moment. About two minutes after this photo was taken the rainbow had disappeared. On a related note the rain has been marvellous. We have had virtually no rain since February (as we reported here) and the downpour in the last few days has refilled the water tanks nicely. In Australia, after at least ten years of drought conditions of varying intensity, even city dwellers know better than to complain about the rain! Today Peter had fun Maths work. He made brownies from the recipe in his Saxon Maths book. With a little help from one of our South Georgia friends, we worked out that a "square" of unsweetened chocolate is actually a 2 inch square. To us a square of chocolate is pictured here in front of the plate of brownies. Phew. Lucky we had someone to translate. Beat the eggs and add sugar. Add the chocolate and butter and beat. Add flour and baking powder and beat. 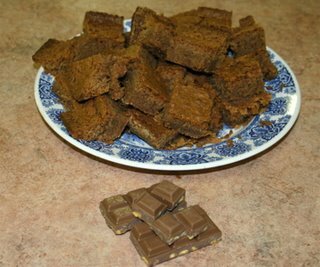 Peter did very well and the brownies are chewy, tasty and probably not low fat. We doubled the recipe and it worked fine in a 9" x 13" tray (Lamington tray). And we ignored the walnuts in the recipe. Kim of Life in a shoe has hosted the Thirteenth Carnival of Children's Comedy. Being the 13th Carnival means that Eric's instructions for watching scary movies leads the billing. Gathered around doing their Maths Quiz. So say many people when they hear we homeschool our six children. I suspect this is just an instant response, without too much thought being given to what “homeschooling” actually is. After all, we may be the only homeschooling family they know and they may have only met me. So, for all those that are concerned that they could never homeschool, I would like to offer the following considerations. God never gives us anything we cannot handle. After all, he is all knowing, all loving and has known us as individuals since the beginning of time. He went through a lot of generations since Adam knowing at what point in history you were to arrive in this world. Oftentimes, the key to happy homeschooling is to approach it not as homeSCHOOLing, but rather raising the people of tomorrow. Even better, remember that the Christian approach to everything is holistic. The Church is concerned with the whole Truth, how everything fits together, how we relate to God and his total creation - body and soul. In a like manner, the family is the domestic Church and we are called to approach the world and God as a complete family, responsible for the whole person of each member of our family. Homeschooling is perfect for this. 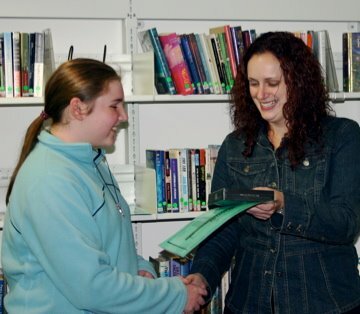 It isn't just about getting good grades. In fact, this is NOT one of the most important reasons to homeschool. I have always argued that homeschooling is the natural way for a family to raise and educate ALL members of the family. “Modern” schooling is a relatively new concept and the results aren’t looking that refreshing. I knew we had to do it as there was no choice, but I had to do the work and prove my case. 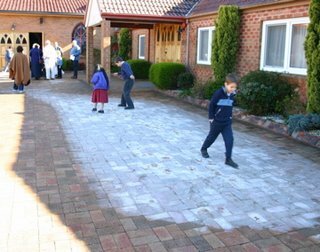 We investigated further by visiting other homeschooling families and socialising with them. We specifically played some games with older children and homeschool graduates to see if they were “normal”. They were and we were ready to give homeschooling a go. With both of us working at it together - me as principal and Lana as head teacher - combined with the knowledge that there is no choice, and lots of prayer, we dived in. Don't worry about trying to recreate a school environment at home - that is counter educational anyway. Most modern schools are designed for crowd control and child minding - education is secondary. How can I claim this? The time within a school day that can actually be directed towards any individual student, the level of distractions in the classroom and beyond and the inability to match the subject difficulty with the student ability all mitigate against a typical school being the best educational option. Don't doubt your ability to teach your own children. The Grace of marriage is a very potent source of strength and power. Keep it charged with regular prayer, confession and the Eucharist. Besides, you are not alone. Your primary support is your husband, God and other homeschooling families - especially great people like those on Magnum Opus email list and the 4 Real Learning forum. Ask for help from other experienced families and invest time in this very important responsibility. As it is one of the duties of a husband and wife to raise and educate children, if you invest the time and energy, God will provide the interest and return. We discussed the issue of the devil's attacks on Magnum Opus. A key point to remember is that he always tries to attack our weak spots. For most mothers, the attack is on their self confidence and to feel as if their work at home is worthless. For fathers it is making them mis-prioritise their responsibilities to their wife and family. Consider the family as the modern equivalent of a monastery amidst the marauding vandals prowling around. The Father has to take his role as protector, provider and spiritual head seriously. Providing the physical needs is not enough. The Mother has to emulate the Blessed Mother and remember the huge graces earned from the most important work of raising children well. Finally, remember that this is the most important work we have in the world today - raising good and faithful families. Guilty? Me? I'm too cute. The other day I was sorting the shelf in my cupboard when I discovered that I hadn't finished eating my lolly necklace from when Clare and I went shopping with Dad. Unfortunately Rose somehow noticed it too and complained. So I gave her one of the lollies and hid it better - rolled up under a pillow on the shelf. Or so I thought. When I came back I discovered that Rose had moved a small chair all the way from the kitchen, stood it against the drawers so she could reach the shelf and then she began sharing MY lollies with Clare. My lollies! I grabbed some of the lollies back and put the rest in my hidden pocket. This is a pocket in my camouflage dress which even I have trouble finding. The girls then began following me around to get my lollies. Somehow, Rose found where my pocket was and I found her hand in there searching for the lollies. So, I then put them in a little black bag which I carried with me wherever I went that day but they were still following me. I started reading and took off my bag. Next thing I noticed was Rose had opened the bag, found the lollies and began eating them again. Aaargh! So I had to put them back in my pocket and sit down. Eric told me that he saw Rose gesturing Clare to come with her and share her booty of MY treasure! Eek! A mouse in the house! 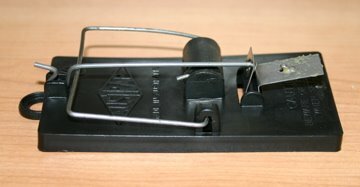 One Mouse Trap. One Mouse. May they meet tonight. On Monday night I was turning out the lights when I caught sight of a movement in my office. It was a mouse scurrying out of sight before I could intercept. It was obviously enjoying itself in the nice warm house on these cold days and nights. Next day we bought a mouse trap and generously spread peanut butter onto the business end, closed the study door and waited. We left it another night and this morning we discovered this. The peanut butter has been licked off! And the trap remained set. We have a tricky mouse here, but we do not intend to repeat the actions of the brothers in the film "Mouse Hunt". Next plan is to extend the area of the business end with a business card so that the mouse has to step on the card to get to the peanut butter.